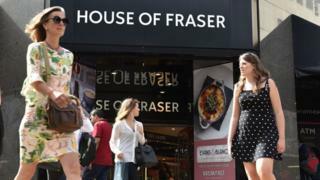 House of Fraser stores in four shopping centres owned by Intu have been saved following talks with the department store chain’s owners, Sports Direct. The stores at Chapelfield in Norwich, Lakeside in Thurrock, Metrocentre in Gateshead and Victoria Centre in Nottingham had been earmarked to close. An Intu spokesperson said there had been “constructive discussions” and “an interim agreement” had been reached. Sports Direct bought House of Fraser after it went into administration. The 169-year-old chain failed to reach an agreement with its creditors in August last year. At the time, Sports Direct chief executive Mike Ashley pledged to save about 47 of the retailer’s 59 outlets. By mid-November he had done deals to save at least 20 stores, protecting about 3,500 jobs, but at least eight were due to close. A previous restructuring plan had proposed to close 31 stores, but that plan was abandoned following Sport Direct’s takeover. House of Fraser stores in Exeter,Hull and Manchester were all recently saved, but its branch in Shrewsbury closed last week and the future of its Birmingham outlet remains uncertain.